Last December Matt Lewis visited a school in Leeds to talk about film with Into Film. Into Film is an organization that gives every child and young person aged 5 to 19 in the UK the chance to experience film creatively. After the visit, one of their young reporters got some time with Matthew and did a Harry Potter quiz and another video getting to know Matthew himself. In this first video he has to answer Harry Potter quiz questions. Matthew does a pretty great job at guessing who said what line and in what film. The next video Matthew answers questions about himself, filming and gives advice to his younger self. 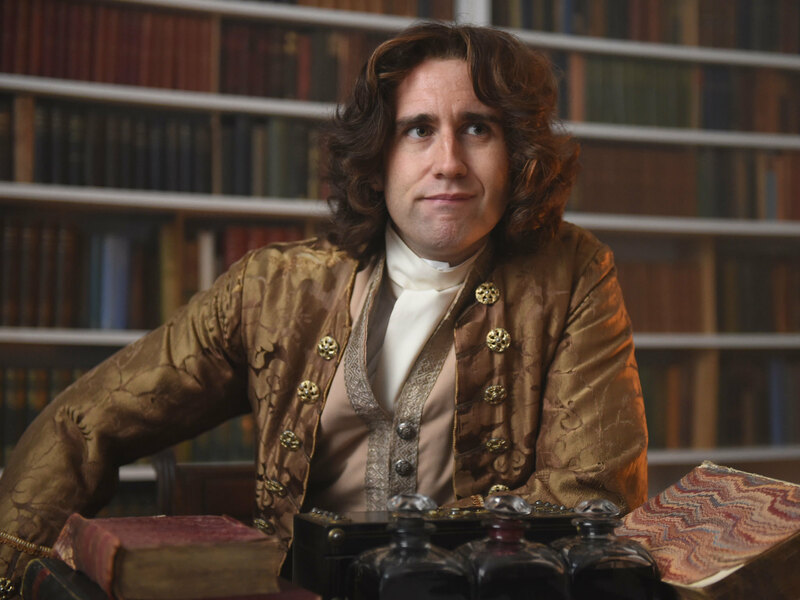 Matt Lewis recently spoke to Time Out about his appearance in Comedy Central UK’s Drunk History. He also briefly discussed how much he appreciates Potter fans and how he’s been getting amazing opportunities because of it.They have also shared a new photo of him as Edmond Halley. Who do you play in ‘Drunk History’? Edmond Halley, the English astronomer, who I think we all know for naming the famous comet. It’s a true story, but with a “Drunk History” twist. I was so thrilled I was able to do it. But I was kind of hoping they’d get me drunk. So you’re in ‘Drunk History’ but you had to do it sober? What a letdown… I know. Let’s see if we can talk them into it for the next series. I’m off alcohol at the minute. I’m teetotal again. When you’re on the bottle, what’s your drink of choice? I’m kind of boring. I’m a beer drinker. Lager. Boring. But I’d probably have to get gin involved at some point. What kind of drunk are you? I’m very loud and I want everyone to listen to what I have to say. I’m quite reserved normally, especially when I go to events – I don’t bother or really even talk to many people. Then, as soon as I have too much to drink, I suddenly want to become friends with everyone. I just become a bit too friendly. Do you have any drunk history of your own you’d rather forget? There was one terrible time. I went to the polo. It’s the most pretentious middle-class thing ever but it’s brilliant. I always get terribly drunk there. I saw Dean Andrews [the actor who plays DS Carling in ‘Life on Mars’] there and I recognised him because he’s famous… but he looks very much like a guy I used to go to football with years ago. In my drunken state I bundled up to him, pushed past a load of people and said: “What the hell are you doing here? Who invited you?” He had no idea who I was and, bless him, he just tried to explain. He was like, “Well, you know, they just sent me a letter and invited me.” I said, “Ridiculous! They’ll invite anyone these days.” Then I just wandered off. He must have thought I was some complete maniac. When was the last time you were really, really hungover? About a week ago. A couple of friends came over to visit me in America. It was Super Bowl Sunday. I had been invited to several parties but I’d been out the night before and I couldn’t move. I couldn’t do anything. I couldn’t even get off the sofa. It was awful. Man, that was a pretty bad one. I don’t normally get that bad. It has to be a special occasion. How well do you cope with a hangover? I’m more obnoxious hungover than I am drunk. I feel incredibly sorry for myself and I let everyone know about it. I feel like everyone needs to wait on me and look after me. I’m better when I’m genuinely ill. If I’ve got flu or a virus I’m much more tolerable. Do you have a go-to hangover cure? Anything with bread and cheese. Pizza is always a good shout. The biggest stuffed-crust pizza you can find. When I was really trying to be healthy I’d immediately get up in the morning and make like a smoothie with spinach, broccoli, fruit and stuff. Remarkably it genuinely does help a hangover. But I can’t do that now. It tastes revolting, doesn’t it?